The young guns from Australia were showing the more experienced teams the way round the race course today on day four of the World Match Racing Tour Fremantle. Sam Gilmour set the tone for an unpredictable day on Bather’s Bay when the local Australian sailor beat reigning World Champion Ian Williams from Great Britain in their opening match. That kind of upset didn’t happen very often in the keelboat era. It was a blast from the past to see a Williams v Gilmour match, even if this Gilmour – Sam – is the less experienced son of the legendary Aussie match racer Peter Gilmour. The Gilmour v Williams match races of past decades were aggressive affairs in keelboats. Today’s battle was in high-speed M32 catamarans, and Sam Gilmour showed a clean pair of heels to Williams off the start line of match 2. 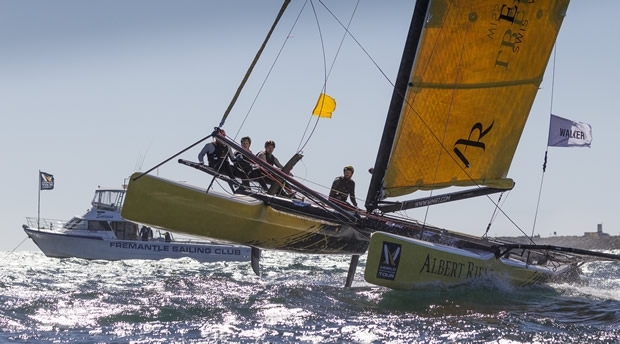 It looked like the young Australian was going to take Williams to match point, but a tactical error – undertacking the layline – handed the lead to GAC Pindar. From then on Williams was unstoppable and went through to the Quarter Finals 3-1. Some other young Antipodeans gave their more experienced rivals from overseas a similar scare. New Zealand’s Chris Steele took a match off regatta favourite Taylor Canfield before US One hit their stride to win the next two and sit on match point going into tomorrow. Australia’s Evan Walker took two matches off Mattias Rahm before the Swede managed to beat the younger team in their deciding match. Royal Perth Yacht Club’s Steve Thomas smashed and grabbed the first match off Nicolai Sehested, but the Danish skipper bounced back with three straight wins. So by and large, the more experienced overseas teams did squeak through to the Quarters, but not Nicklas Dackhammar who fell 3-0 to local talent Matt Jerwood. The harsh scoreline doesn’t really tell the full story though, as the Swede who had been so fast the previous day in the strong conditions of the Fremantle Doctor was dogged by some unfortunate gear failure in match one. Another Swede with good experience of the M32 – Olympic silver medallist Hans Wallén – overcame Switzerland’s Eric Monnin to go through to the Quarter Finals. France’s Yann Guichard sits on match point after beating Western Australia’s hottest match racing talent Keith Swinton 2-0. New Zealander Phil Robertson will be kicking himself that he isn’t sitting on match point after gifting Australian Murray Jones a point when the more experienced Kiwi wrapped his M32 around the leeward mark whilst in a comfy lead. Instead Robertson and his crack squad sit on 1-1 against the up-and-coming Jones. It has been that kind of day, a shake-up of the old order in match racing. By and large, experience has shone through, but not without a few scary moments along the way. As for Jerwood, he’s rubbing shoulders with the big boys tomorrow when we see who can muscle their way out of the Quarter Finals and into the final four.